Günter Seeger NY is a Michelin Starred restaurant from Chef Günter Seeger, located in the West Village. The restaurant serves market driven, New American cuisine utilizing classic techniques. Our Chef's Table is inspired by a Stammtisch and the traditions of the Black Forest. The communal table gives an unobstructed view into the kitchen and the chefs at work. A Ten to Twelve course menu at $198 per person is served, with the menu changing nightly. A wine pairing is also available. Reservations can be made 30 days in advance online & 60 days in advance by phone. Please allow 3 to 3.5 hours to dine. Because of the nature of the Chef's Table, ability to accommodate dietary restrictions is very limited and need to be communicated in advance. 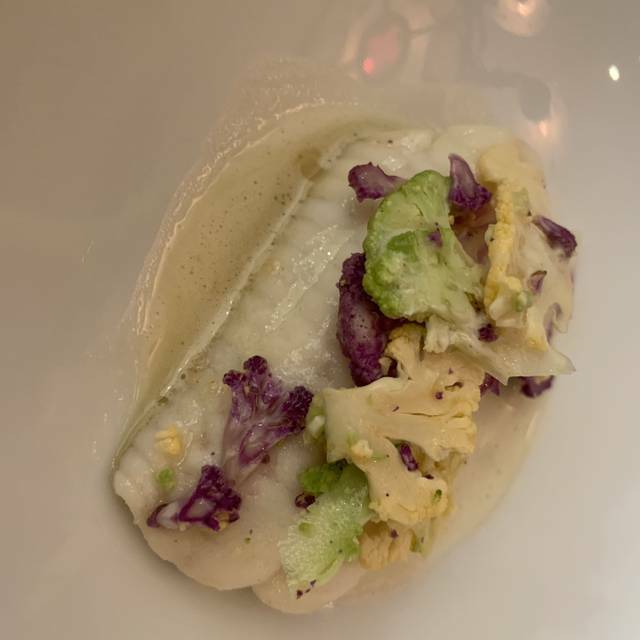 The service was great and the food was well cooked but this place lacked the adventurous experimentation with food that you expect with this type of tasting menu. The flavours were normal and nothing really sparked that playfulness you hope to experience when paying this level of money. The highlights were the lobster and the caviar. The sommelier was insightful and the wine she helped us select was great. Overall this place is good, just not that memorable. Well done but forgettable. Uninspiring. Fantastic! A gastronomic delight. The Chef runs a tight ship and nothing leaves the kitchen without his approval. Wonderful staff as well. Impeccable service. Thank you for a most enjoyable dining experience! Awesome. Chef and crew work like a well oiled machine. Although it appeared the chef demands a lot from the staff. We had the Chef's Table course with wine pairings and I have to say we had one of the best culinary experiences I can remember. Everything was impeccable: the food, the wine, the service, the ambiance and of course Chef Gunter himself. The various wait staff are buzzing around the periphery of the table, making sure that your experience is nothing less than superb and Chef, who is never far away in the kitchen right next to the table, checks with the table and finishes dishes in front of you with superb accouterments. Unbelievably beautiful restaurant with world class service. Chef Seeger never fails to amaze. Simply perfect food. Much better than most Michelin three stars in New York. It was my wife's birthday. We were very well taken care of by everyone on the staff from the reservation, host, servers, cooks...top notch service without being pretentious. Sat at chefs table nearest to the (immaculate) kitchen. The chefs table is communal - so we met some new people that also live in the same neighborhood. Great laughs with new friends and figured out we knew some of the same great people. Small lovely world. Just outstanding dining experience. Michigan star that is totally worth it. Wonderful experience from start to finish. 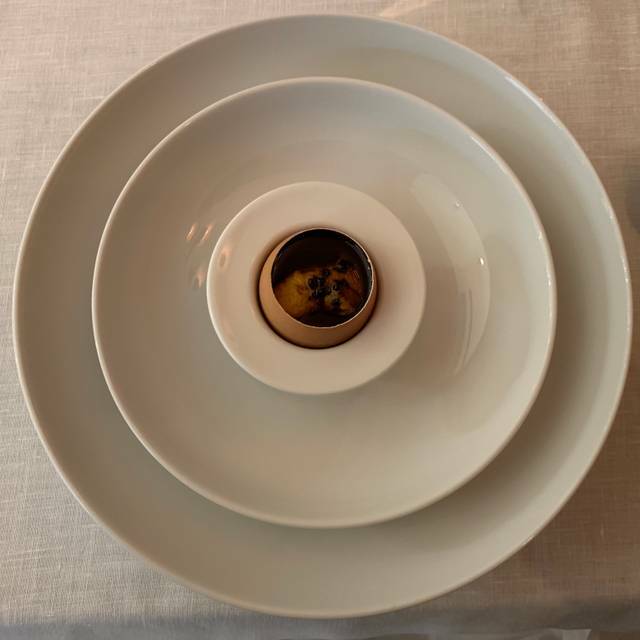 Professional service, beautiful room, exceptional dishes in the tasting menu. Worst experience ever. Does not deserve Michelin star. The food was exceptional, light and yet tasty. The wine pairing had variety, but someone who loves white wine will particularly enjoy this list. Obviously the meal was more on the formal side but everyone was very friendly. The communal chef's table is not too big and encourages socializing. We talked a lot about food, since that apparently is one shared interest if you are dining at the chef's table. Be prepared to be there for the whole night, it was like a 6:45 - 11pm+ dinner. The hours just flew by though as we had an awesome night with great food and wine, and a chance to meet new people. The restaurant overall was wonderful. The food delicious and varied and eclectic. However, for what you pay and what you get I find it not worth the value. I was at the Chef’s table for a special chef’s menu, seated with my husband and 6 strangers. I don’t mind communal sitting, but for a special meal of this price, I should not have to sit on a wooden bench with no back, shared with another person. I would say the seating and furniture for the chef’s table is far below the meal’s pricetag and very uncomfortable to say the least. In addition, the wine menu should offer lower priced wines in all categories. The lowest price wines were only available in the Riesling section, which in general is too sweet for my liking. It would be nice if the Chef takes a moment to greet the customers at the Chef’s table, and offers an amuse bouche. This was not the case at Günther Seeger’s. I would go back for the porcini carpaccio, the langoustine ceviche and the egg with bottarga. The food was very good, and the service and attention to detail were impeccable. The chef’s table tasting course was a bit too long though. It took 4 hours to complete 11 courses (+ 2-3 extra courses). We had a wonderful dining experience at the communal table where we met some wonderful new people whilst enjoying an incredible meal together. I initially took my husband for a quiet birthday dinner for two which quickly turned into fun conversations and laughs. Our table got to meet the chef and his kitchen staff afterward. One of the most wonderful dining experience , from the Sommelier to the Chef who came out and greeted us personally. This restaurant should be getting all five stars, the food was that good. It was delicious, imaginative, and beautifully presented by an excellent staff. However, the seating at the Chef's Table was AWFUL. Knowing that adults will be sitting through a 4-hour experience and providing only a wooden bench without a back? That ruined the pleasure considerably. While the entire restaurant was filled with beautiful tables and chairs, the chef's table had 2 plastic chairs on one side and a aforementioned bench on the other side. This seemed unfair and unnecessary. Too bad, I can't recommend people subject themselves to this. One of the best meals I've had. All of the courses were relatively simple, but the flavors were incredible (well beyond their ingredients). I'm still rather blown away thinking back. The Chef's Table was an enjoyable experience with excellent food. Personally I prefer a little more description with the courses but I get the clear and concise vibe they were going for. The white pairings in the first half of the evening ranged from strong to excellent, with the latter combining with the food to reach a new level. The switch to reds (and non-German wines) in the second half lead to more mixed results. Portion sizing and pours for the pairings were perfect. With courses served at a relaxed but consistent pace it made for a wonderful evening. Excellent Tasting menu at the Chef's table. Great service, and room ambiance. This is a restaurant where you will find it difficult to beat the wine pairings, unique wines, outstanding fits with the food. We sat at the chefs table and had an Absolutely unbelievable meal ! The service is outstanding and the food and wine is creative and heavenly. Chef was confident, chill & cordial & came to our table from time to time to check in & answer questions. We did wine pairing which was perfect and their hand blown glasses in all sizes were an absolute pleasure to drink from - All German wines which were unfamiliar to us - So lovely! Staff was attentive, "proper", yet accessible (my husband & I noted that the ladies in tight suits & hair buns needed to be in an old school Robert Palmer video!). We enjoyed having a laugh with them! Room was spacious & simple with soft funky lighting & whimsical art (chefs' choice, I believe). All over, stunning experience for my birthday and or any special day!!! La Chef Table´s es una idea espectacular. Ha sido sin duda mi mejor cena en NYC , He estado en 30 restaurantes de los buenos buenos. La comida es memorable, la atención un 10. Los vinos, y el maridaje son muy buenos. Perfect food. Chef is a genius. Service is impeccable. The restaurant is absolutely beautiful. Go now and go often! My husband and I dined at the Chef's Table and had a fantastic time! We were seated in a small lounge near the entrance and offered a glass of German sparkling wine that was quite good as we waited to be seated. 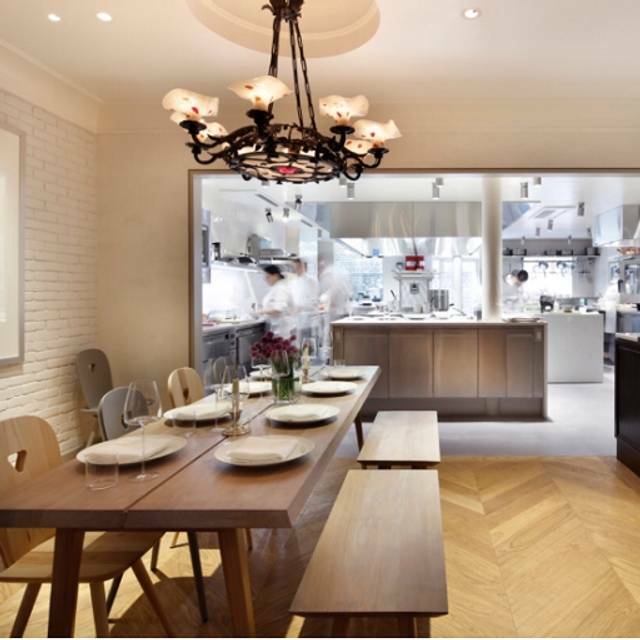 The chef's table is positioned next to the gleaming, well-appointed kitchen. Our only complaint is that there are chairs only on one side of the table so my husband had to sit on a backless bench for a few hours, which is not very comfortable, and if you're not seated on an end it can be challenging getting in and out. The dining room is lovely and serene and would be a good alternative for a more private experience. We were very lucky to be seated next to a fun and interesting couple so it was a highly social experience, which we enjoyed. We were served a 10 course prix fixe menu. The food was exquisite to the eye and palate, and the wine pairings very good. We savored every bite. Service was attentive and personable. We could watch the chef and his team preparing the food, though we were a little surprised that he didn't come over at all to greet us as is common at chef's tables. However that's a minor point, considering the skill and artistry of this chef, he must prefer to concentrate on cooking. It's a pricey meal but well worth it for the quality. There is a dress code so this is the time to break out your finery and prepare to be wowed. The meal was excellent. Every course was great, some very simple but delicious, others like the quail in an artichoke showed incredible technique and flavor. Fun wine list is small but hits great wines from everywhere. Service was attentive and unobtrusive. Watching everyone in he open kitchen work so well together was an awesome experience. A fantastic and immersive experience. This is the location for a true tasting menu and a great location for any special occasion. A true gem. What a delectable meal! The flavor profiles for each course were simple, yet divine. The service was impeccable. Highly recommend to anyone considering a tasting menu experience.